As tight as security already is in Times Square, it's about to get a whole lot tighter tonight. 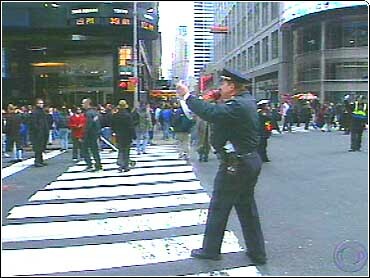 CBS News' Russ Mitchell reports on the lengths to which they're going to make Times Square as secure as they know how. In just a few hours, New York police will go into their full security mode. Just after midnight, cars will be cleared out of Times Square. By this time tomorrow, some eight thousand police officers will be working here on the ground, on the roofs of buildings and in the air. Today Times Square event organizers tested the crystal ball that a billion people around the world will see drop at midnight. They're not anticipating any problems with this tradition or security. "We have the absolute best people in the world working on this and this event is the best managed, most secure public event that you can imagine," says Brendan Sexton, a Times Square business leader. New York police say their plan has officers ready for any disaster, whether it be on land or underwater. Events will be monitored from a central command center, a strategy also being used in other cities around the country, including Austin and Atlanta. In Boston today , police said they've been preparing for New Year's 2000 for two years. "Since the World Trade Center bombing a couple of years ago, most major cities have been prepared for this kind of event." says one Boston policeman. And in the Florida Everglades, police are already busy, dealing with a 20 mile traffic jam as thousands head for a New Year's Eve concert by the rock group Phish.